These freshly picked fiddleheads will be ready to cook once they are thoroughly cleaned in cold water and the brown "papery" layer removed from each fern. As foragers take to the woods and riverbanks in Maine to collect the spring’s first tender fiddlehead shoots, their counterparts across the border are being warned of health risks associated with this year’s wild crop. Last week the New Brunswick Department of Health issued a warning that fiddleheads found growing in areas hit by the provinces’ record floods this spring may be contaminated and unfit to eat. According to a report by the CBC, the ferns may have been exposed to raw sewage, fuel and chemicals leaked into the rivers during the flooding. According to officials with the Maine Department of Agriculture, Conservation and Forestry, there are no health risks associated with Maine fiddleheads. When Mainers forage for fiddleheads, they are going after the young ostrich fern while it is in the “fiddlehead” stage with its top curled into a tight spiral. The only edible fern in Maine, the ostrich fern is recognized by its smooth, shiny deeply grooved stems that are covered in a brown “papery” peeling layer. While there was some flooding in Maine this spring, Ron Dyer, agriculture, food and rural resources bureau director with the Maine DACF said the high waters pose no threat to Maine’s wild fiddleheads thanks in large part to the quality of the state’s waters. That does not mean, however, that people should pick and then immediately pop a fiddlehead into their mouths and eat it raw, Dyer added. “Eating them raw or undercooked really is putting yourself at risk,” Dyer said. According to a University of Maine Cooperative Extension bulletin, over the years The United States Centers for Disease Control and Health Canada have investigated outbreaks of foodborne illness associated with eating raw or undercooked fiddleheads. Symptoms of illness from eating undercooked or raw fiddleheads include diarrhea, nausea, vomiting, abdominal cramps and headaches. The symptoms hit within 30 minutes to 12 hours after eating the fiddleheads and last around 24 hours. According to the cooperative extension information, the best and most reliable way to clean fiddleheads is by placing the freshly picked ferns into a colander and thoroughly rinsing or spraying them with clean, cold water. Next, submerge the fiddleheads in a bowl of clean, cold water and those papery layers should float to the surface where they can be scooped up and discarded. That brown papery substance won’t make you sick, Dyer said, but it’s pretty unpleasant feeling on the tongue. Mainers being a crafty bunch, over the years some have developed a variety of ways to separate that papery layer from the fern — from placing them in a screened, rotating drum and blasting them with high pressure water, to loading them into pillowcases and running them through a cycle in the dryer. Cleaned fiddleheads can be refrigerated for up to a week. 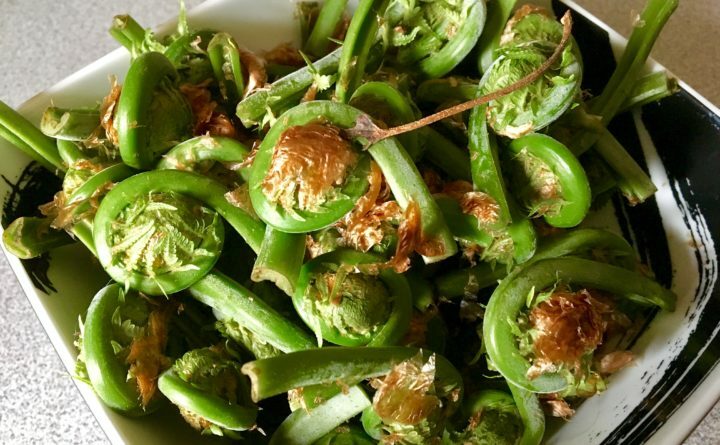 When it’s time to cook up what many Mainers refer to as “a mess of fiddleheads, Dyer said they should be steamed or boiled for 10 to 15 minutes. The greens can be a unique addition to stir fries, quiches or even pizza, but should be cooked before being added to any recipe. In Maine, the fiddlehead season usually runs from April into May, so the time to enjoy this springtime edible fresh is finite.